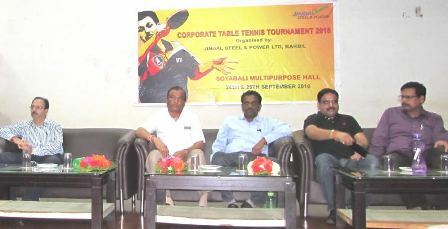 In a first of its kind effort to build a cohesive relationship among corporates through sports, Jindal Steel & Power Ltd (JSPL) Barbil Unit has organised a Corporate Table Tennis Tournament at its Soyabali Colony. Participated by sixteen corporate teams from the state as well as outside, the one of its kind Table Tennis Tournament has been inaugurated on Saturday. Joda DDM Mr. Sushant Kumar Nayak gracing the inaugural ceremony as chief guest inaugurated the tourney. Inaugurating the tournament Mr. Nayak lauded the effort of JSPL Barbil Unit for organising such a wonderful tournament which has brought many corporates under one umbrella. This tournament will certainly build very good relationships among all the corporates, said Mr. Nayak. EVP & Unit Head, JSPL Barbil, Mr. T S Shanbhogue presiding over the Opening Ceremony said that sports & games keeps body and mind fit. Sport is the best way to keep stress and mental pressure away from us. Now-a-days everyone is under mental stress and ignoring physical labour. In this context sports has been playing a significant role to keep ourselves mentally & physically fit, said Mr. Shanbhogue. He welcomed all the corporates to the tournament & expressed pleasure over their participation and guided one and all to play in the spirit of the game. Attending the inaugural ceremony, AVP – HR & ES and the brain behind the tourney Mr. Alok Malhotra said that JSPL under the guidance of its Chairman Shri Naveen Jindal Ji has always had the culture to promote sports. “We at JSPL, Barbil have been promoting kickboxing in the local periphery and our talents have brought laurels in National level & will soon be participating at International level. By organising Corporate Table Tennis Tournament, we are carry forwarding our legacy of promoting sports”, said Mr. Malhotra. Sixteen teams from different corporate houses participating in the Corporate Table Tennis were Tata Steel Noamundi, SAIL Kiriburu, JSPL Patratu, Tata Steel Joda FAP, Arya Steel, SMPL, JSPL Barbil, Tata Steel Joda East, SAIL Meghataburu, Tata Sponge, JSPL Angul, Tata Steel Joda West, SAIL Gua Mines & SAIL Bolani. The tournament was been played in knock out method. In the inaugural day of the tourney SAIL Meghataburu, SAIL Gua Mines, Tata Joda-West & JSPL,Angul, have entered into semi-finals by defeating their respective opponents. The tourney will be concluded on Sep 25. All the participant teams were given participation prizes. All the corporates participating in the tournament appreciated the effort of JSPL Barbil Unit for giving them a platform to showcase their talents. The Corporate Table Tennis Tournament organised by JSPL, Barbil witnessed jam-packed hall by the employees of JSPL as well as their family members. Paddlers from different corporate teams displayed swift & nice paddling skill on the table. Attack, defence & managing the ball on table with swiftness by the paddlers grabbed all eye-balls in the hall.